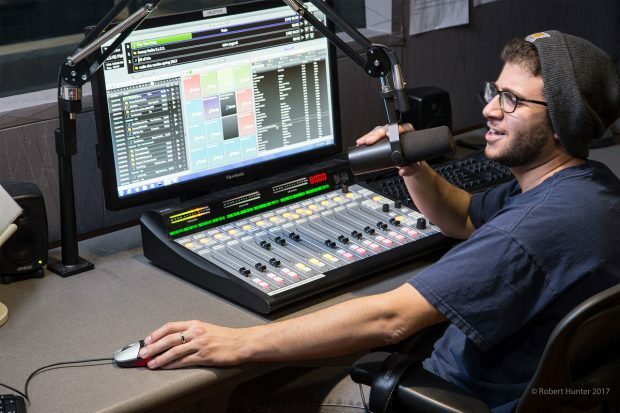 In a world increasingly saturated in social media and other forms of digital communication, it may come as a shock to some when they learn that are still students who are passionate about radio broadcasting. This wouldn’t come as a surprise to the Student Media Center at Salt Lake Community College, where students collaborate and experiment to produce the school’s very own internet radio station, Radio SLCC. Students enrolled in COMM 1560, Radio Performance & Production, have the opportunity to have their own show on Radio SLCC. “The purpose of the station is to give students access to equipment that they’d use in the real world to help them build their resume. So, if they go in for a job interview at a big radio station, they’ll have a one-up on people coming in that don’t have any experience,” says station manager Zac Hodge. 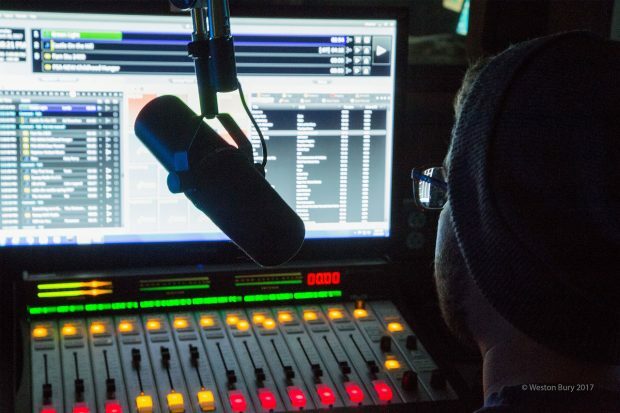 Radio SLCC is a top 40 music station that also airs school-specific news, interviews and play-by-plays of SLCC sports events, among other things. When hosting their own show, students can talk about whatever they’d like, from video games to fashion or sports. “We had a couple of students — I think it was last fall — where they did a sport show together and then both of them actually got internships at ESPN 700. Then they both ended up getting hired as back-end producers. So, they started their sports show here and then actually got hired on there,” says Hodge. Above all, Radio SLCC is exactly what the name would imply — a radio station for Salt Lake Community College. Hodge admits the audience isn’t huge, but the station serves nicely as a lab for students to improve their skills without the kind of pressure that would come from a larger platform. However, he does see room for expansion. “What we want to do is get it more relevant on the campus. You know, we want it playing in forums where they’re playing music. If it’s in a cafeteria and they’re playing music, we’d like it if they’d play our radio station,” says Hodge. Recently, the station was happy to host SLCC President Deneece Huftalin, who was on air with Richard Scott, the dean of the School of Arts, Communication and Media, as well as Clifton Sanders, the provost for Academic Affairs. Alongside that opportunity, Radio SLCC is also excited to be working on an app. They’ve yet to announce an expected date of completion but hope it’ll be in the near future. Students can stream Radio SLCC anytime. For more information, contact station manager Zac Hodge at 801-957-3064 or visit the studio in the Center for Arts and Media at South City Campus.